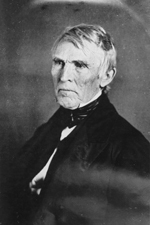 CRITTENDEN, John Jordan, (uncle of Thomas Theodore Crittenden), a Senator and a Representative from Kentucky; born near Versailles, Woodford County, Ky., September 10, 1787; completed preparatory studies; attended Pisgah Academy, Woodford County, Ky., Washington College (now Washington and Lee University), Lexington, Va., and graduated from William and Mary College, Williamsburg, Va., in 1806; studied law; admitted to the bar and commenced practice in Woodford County, Ky., in 1807; attorney general of Illinois Territory 1809-1810; served in the War of 1812 as aide to the Governor; resumed the practice of law in Russellville, Ky.; member, State house of representatives 1811-1817, and served as speaker the last term; elected as a Democratic Republican to the United States Senate and served from March 4, 1817, to March 3, 1819, when he resigned; chairman, Committee on Judiciary (Fifteenth Congress); moved to Frankfort, Ky., in 1819; member, State house of representatives 1825, 1829-1832; appointed and was confirmed as United States district attorney in 1827, but was removed by President Andrew Jackson in 1829; nominated in 1828 by President John Quincy Adams as an Associate Justice of the Supreme Court of the United States, but was not confirmed by the Senate; again elected to the United States Senate as a Whig and served from March 4, 1835, to March 3, 1841; appointed Attorney General of the United States by President William Henry Harrison March to September 1841; appointed and subsequently elected as a Whig to the United States Senate to fill the vacancy caused by the resignation of Henry Clay and served from March 31, 1842, to June 12, 1848, when he resigned; chairman, Committee on Military Affairs (Twenty-seventh and Twenty-eighth Congresses); Governor of Kentucky 1848-1850, when he resigned; again appointed Attorney General by President Millard Fillmore 1850-1853; again elected to the United States Senate as a Whig (later American/Know-Nothing) and served from March 4, 1855, to March 3, 1861; chair, Committee on Revolutionary Claims (Thirty-sixth Congress); chair Committee on Foreign Affairs (Thirty-seventh Congress); elected as a Unionist to the Thirty-seventh Congress (March 4, 1861-March 3, 1863); was a candidate for reelection at the time of his death; died in Frankfort, Ky., July 26, 1863; interment in State Cemetery, Frankfort, Ky.
American National Biography; Dictionary of American Biography; Kirwan, Albert D. John J. Crittenden: The Struggle for Union. 1962. Reprint. Westport, CT: Greenwood Press, 1974; Ledbetter, Patsy S. John J. Crittenden and the Compromise Debacle. Filson Club History Quarterly 51 (April 1977): 125-42.